Save us from the time of trial During Lent this year, our church decided to start using the “modern” version of the Lord’s Prayer. I think it was to help keep us on our toes as a congregation, lest we fall into liturgical complacency. Now, I wasn’t raised an Episcopalian (and only nominally Christian at that), so I didn’t even know there were two versions of the Lord’s Prayer. During Lent this year, our church decided to start using the “modern” version of the Lord’s Prayer. I think it was to help keep us on our toes as a congregation, lest we fall into liturgical complacency. Now, I wasn’t raised an Episcopalian (and only nominally Christian at that), so I didn’t even know there were two versions of the Lord’s Prayer. You can’t deny how beautiful it sounds. We joined our church, I was baptized, and I remained oblivious to the modern version of the Lord’s Prayer for six years. Until Lent of this year. And I’ll admit to sort of shrugging with ambivalence and dutifully reading the words of the modern version at the appointed time. We’re a fairly low-drama parish and the traditional-to-modern switcheroo seemed to go over pretty smoothly, so they decided to keep using it after Lent was over. We now say the modern version of the Lord’s Prayer as part of our Eucharistic prayer every Sunday. Well thank goodness they print it in the bulletin, because I still don’t have it memorized. I’m generally pretty good at memorization and recitation. I was able to recite our frequently used prayers and the Nicene Creed without referencing the text after about a year of regular worship. I suppose that because I learned the traditional version of the Lord’s Prayer as a child is what makes it so deeply ingrained in me, which means it will take active mental effort to replace one version with the other. To put it another way, the neurons in my brain are going to have to work harder to rewire this already well-established pathway. It’s funny that I should bring up neurons in an essay about the Lord’s Prayer, because, as it turns out, I just had brain surgery to remove a large tumor less than three weeks ago. Yup. True fact. And because I’ve been recovering from said brain surgery, twice now I’ve been the recipient of “Communion under Special Circumstances” when one of our parish priests has brought it to me at the hospital and my home. The Lord’s Prayer is a part of this brief service and I have a vague-ish memory of stumbling through the modern version with our rector while in the hospital. 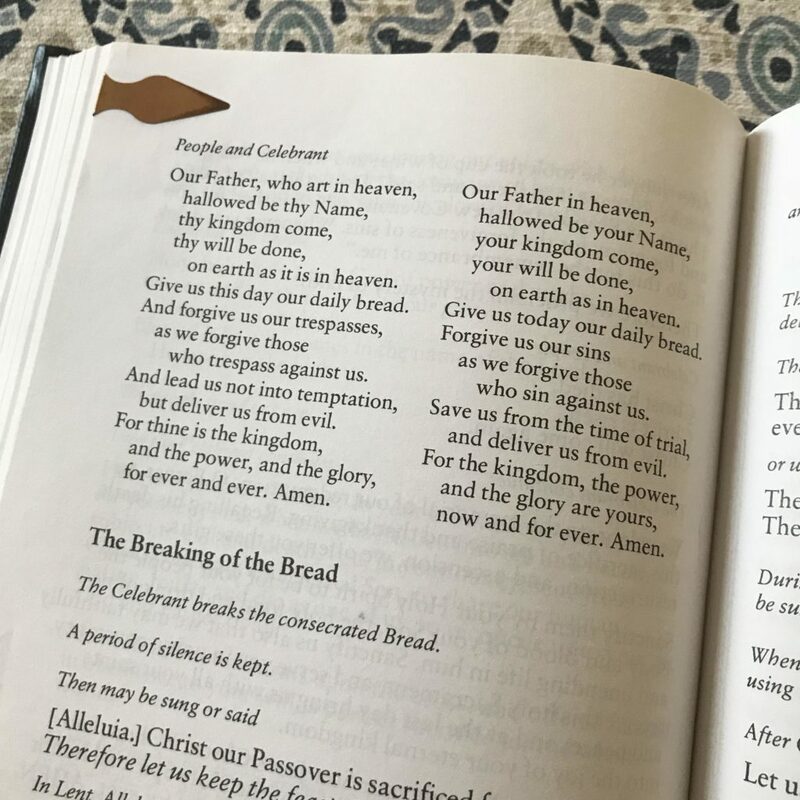 Earlier this week our other priest visited me at home and when we got to the part where we were to say the Lord’s Prayer together, I asked quietly, “which version?” She offered me the choice and I went with traditional, because I knew I could say it with confidence. Brain surgery can make a person think about things, and now I wonder if my over-reliance on the the traditional text has something to do with the small and narrow perspective of Christianity that I carried with me from childhood, right through my baptism, and multiple years into my life as an active, trying-to-be follower of Jesus. “Let’s try not to do bad things and and sin” is how that part of the prayer slotted in. I have no doubt that what my family and I are going through right now qualifies as a Time of Trial. And DARN if this isn’t really hard. And God didn’t stop it from happening to us. But these past three weeks we have witnessed miracles big and small that have been simply revelatory. Reading that line and whispering those words in the early morning quiet when I shuffle restlessly around the house while others sleep, I know with the full confidence that only God’s grace and love can give me, that we yet are saved. But just you try to pry those words from my lips. Thank you for sharing this story with us. I will hold you and your family in prayer as you continue to go through a time of trial. Hal, Thank you for your kind words and prayers! I too struggle with the modern version, especially with “the time of trial,” which has always seemed like a bad translation to me. But thanks to you, I know what periods of my life that phrase is referring to. Thank you for sharing this beautiful revelation from your time of trial. My thoughts and prayers are wth you and your loved ones. Elizabeth, Thank you so much – I’m glad that this essay was something that resonated with you. I am old enough to remember our “old” (Canadian) Book of Common Prayer and the days when the King James Version was king. When the Revised Standard Version of the Bible came out, in my teens, I was definitely a fan. When there was only one Bible, the 1611 KJV, Bible memorization was still encouraged and everyone knew only one version. I even had to memorize the 23rd Psalm in grade 6 but was startled to find the Prayer Book Version was significantly different from the Bible version! The upshot has been that Bible memorization has became much more difficult. Does anyone even do it now? 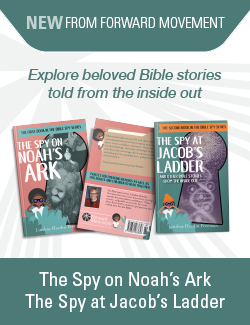 Once you’ve become slightly familiar with the New English Bible, the New Revised Standard Version, and many others, the KJV no longer “set in stone” in our minds as it was formerly. The question is, which one to memorize. The answer I fear has become “none of the above”. Yet there is great blessing in Scripture Memorization. Favourite verses still come to my mind and in my prayers. I am a (very) retired priest and once had the opportunity to celebrate the Eucharist in England. While I got through it all right there were a few disconcerting hesitations and stumbles. I wasn’t surprised became I knew the English BCP wasn’t quite the same as the Canadian BCP that I was completely familiar with. But forewarned in not forearmed. It detracted from the dignity of the service to have my eyes firmly locked onto every word of the Altar Book. It made it harder to keep my heart and mind on Jesus. Not impossible, but confusing. Am I against change? No. However we must consider what we lose and balance it against what we gain. Perhaps, in some cases, “the old [wine] is best”, and revisions should be few and seldom. Leslie, what an interesting story you shared. To the limited extent that I grew up in a faith tradition, my earliest exposure to the Bible was the King James Version and I remember memorizing the 23rd Psalm and Luke, Ch. 2 v 2-12 in the parochial school I attended for Kindergarten. Being relatively new to the Episcopal church, this is the only BCP I know and it has been a comforting friend to me and I admit to being nervous about future changes. Over the years I have taught children Sunday School and young people in Youth Group. Many years ago I was teaching a large Confirmation Class of 13 and 14 year olds. One week I had them look at and read together the ‘traditional’ Lord’s Prayer and the ‘New’ Lord’s Prayer going line by line. When we got to, “And forgive us our transpasses” vs. “Forgive us our sins”, one young woman exclaimed extendedly, “You mean it does’t mean don’t go on someone else’s land?” What an eye opener for these young folks and me! Since that day I have used the ‘modern’ prayer in my daily prayers as a reminder of the meaning of the words of the prayer. During Lent this year, our church decided to start using the “modern” version of the Lord’s Prayer. I think it was to help keep us on our toes as a congregation, lest we fall into liturgical complacency. Now, I wasn’t raised an Episcopalian (and only nominally Christian at that), so I didn’t even know there were two versions of the Lord’s Prayer.